Formerly known simply as the Duke, this pub underwent major refurbishment beginning in February 2007 to become a well-reviewed gastropub offering British and Spanish food. 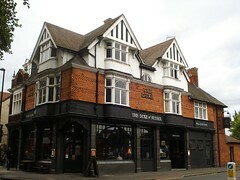 It was then acquired by Greene King in April 2011, along with the rest of the Realpubs chain. Our comments below predate the takeover; however, signs are that Greene King intend to retain the Realpubs "concept". The decor is fairly standard-gastropub with lots of bare wood photo. They have nice big windows looking out over the road to [Acton Common]?. As of October 2008, food is served 5pm-10:30pm Mon, noon-10:30pm Tue-Sat, and noon-9:30pm Sun. On Monday nights they have a "wine club" where you can bring your own wine to have with your dinner (no corkage is charged). Bob visited on a Thursday lunchtime in March 2008. Three handpumps were visible, with two on. The food menu was on the expensive side. I started with razor clams with chorizo and chilli (£6.25) photo and followed this with pollack steak (£12) photo. My pint of lemonade and lime was way under £2 since I got change from £20. Kake visited late afternoon on a Tuesday in May 2008. There was just one other customer. Service was friendly. Background music (Beach Boys) but not annoyingly loud. Free wireless working fine (no password needed). Half of Everards Tiger was £1.60. Last visited by Kake, 13 May 2008. Free wireless last verified on that visit. Opening hours and food times taken from sign outside, October 2008. Last edited 2013-05-10 07:05:42 (version 19; diff). List all versions. Page last edited 2013-05-10 07:05:42 (version 19).